Take a journey with MOPDC and the creation of our new piece Song and Dance You. Get a behind the scenes look at our rehearsals, company research, as well as questions we are grappling with as we prepare for our FLICfest 2016 performance in January @ The Irondale Center. This blog is a reflection of our process, and dedication to approaching difficult material with integrity, empathy, and courage. Check in bi-weekly for new posts. Song and Dance You will premiere Jan. 29th and 31st as a part of FLICfest 2016 @ The Irondale Center. Blog by Candace Tabbs and MOPDC Dancers. 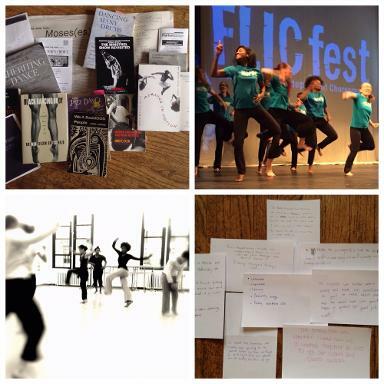 On Monday night, November 16th, we showed the skeleton of work we created thus far, a textually and thematically dense collection of thoughts, ideas, comments and sketches to the fellow independent choreographers of FLICFest 2016. We presented a collection of approximately 30 minutes of material; text, movement, sound, and play with space and audience in the space in which we will present in January. The Irondale is a dream of a performance space. With a large stage, ample seating for audience in a variety of orientations and a balcony space. The possibilities one can receive and be a part of the work are endless. And we are definitely utilizing all aspects of this space for our piece. After showing our work in process, we had the chance to dialog with the other choreographers in a discussion moderated by Jeramy Zimmerman, FLICfest producer. The choreographers were asked to give their initial impressions of the work, what they saw, what, if anything, intrigued them. In the talk back, MOPDC Artistic Director, Joya Powell, shared her questions about the work and ideas on which she wanted feedback. One striking moment for one of the choreographers was the eerie contrast between grinning and stoneness. We as a company have been working on the transition from the minstrel movement and ideas to the more contemporary dance motifs; how we can navigate those transitions with seamless honesty. Pertinent questions about the grinning later emerged in the conversation. What is the grinning? Is it the same for everyone? Is it the same every time? Given the inherent performative nature of minstrelsy, another question that was brought up was the relationship between audience and performer. One choreographer asked, “Do I [audience member] laugh with you? Is ‘the masking’ a central point? If so, everything should point to it.” Another choreographer remarked, “humor is a mask, a way into the material.” Some words that the choreographers in attendance used to describe what they saw included: appropriation, circle, movement, blackness, profusion, juxtaposition. Another major theme that arose in the remarks from the showing was the need for a clear through-line, the story that brought all of the vignettes together. In her remarks, Joya opened up about time. Time is an uncomfortable subject for anyone creating work. Are you using it wisely? Do you have enough to flesh out all of your ideas? How will you use your time to cohesively link your ideas together? How will you use the time that remains? Bearing in mind the feedback from our first showing, we dove back into rehearsals with more information and ideas to help our process, tackling some questions about the development of the story and strengthening the weaving of text and movement. About a month later, on Sunday December 13th, we emerged with another installment of our piece for an in-studio showing for some esteemed colleagues. With fresh eyes on our work, we presented our progress. Some great insight that our colleagues brought in feedback included asking us how are we looking at each other. It is more than just looking at each other in space and looking at the space we create to bring the audience into our work. In order to create genuine interaction, we must collectively experience genuine emotion. And we are working toward those moments of solidarity. Another colleague remarked about his response to the work, “How do you situate yourself in this work? In this reality in the US? Don't act it, be it.” We are continuing to find that truth. Finding how to be and exist in this work and be truthful in our pursuit. "I feel our piece is the essence of a Minstrel show but not a straight-forward one. One that goes in and out of Minstrelsy and into direct commentary of what our society is facing." "When I was in high school I read a book called "The Artificial White Man." It describes the process of becoming white, exploring the idea that whiteness is in itself a mask, a privilege, developed and enforced by society. I think it's interesting how different groups become white and gain privileges in society." "In rehearsal this past Friday, we started to explore the theme of interracial relationships and the backlash against them. I was given a choice to choreograph movements representing either the perspective of those disapproving family members or of myself. I chose to work with the resentful, bigoted character because I felt and continue to feel too close to my own pain surrounding my family's reactions. I am not yet able to create movements to portray that conflicted, complicated hurt. The separation (although minor) from the disapproving character allowed me the ability to create and choreograph for that perspective." Twerking is a funny, funny thing. It is appropriation. It is sexualization. It is sexuality. It is before Miley Cyrus. We talk about this living organism, the Twerk, as if it only existed once Miley Cyrus showcased Black women booty popping in her videos, once Taylor Swift tried to shake with us [Black women]. Booty popping is agency. And it is a command over my body to do with it what I choose, when I choose. It is about letting you see me, watch me. Inviting you into my Body Party. Letting you pull up a chair. So why is it used in mainstream music and entertainment as a an ugly, dirty movement fit for the Other? Why are white music artists employing black female bodies to do the black booty dance? Why can we not celebrate our bodies [in peace]? Are we nothing more than Sarah Baartman reincarnates? As dancers and performers, what we do with our bodies is necessary and sacred. Even if our choices are subconscious, who we are informs how we are. Whether we can twerk or not is not as important as the choice to do so. In a section of the work, company members are creating a movement chronology of the twerk: how a dance with deep African roots, celebrating the body morphed into a mainstream phenomenon. Would we convey the same message with or about twerking with only Black bodies, with only Black female bodies, with only female bodies? How do we comment on the hyper-sexualization of the Black [female] body without the audience seeing only sexual movement? Does it even matter what the audience takes away? Is it all about agency anyway?- I chose to let you see, you chose to take from it what you wish. We are at it again! MOPDC is embarking on a new journey of socially conscious dance theatre. Our newest work, Song And Dance You, is an evening length collaboration between MOPDC, violinist Zoë Aqua, Playwright Amina Henry, and our socially conscious choreography workshop participants. This work looks to answer the question: what will it take for Black Lives to Matter to all people? This is probably one of the most emotionally charged and challenging pieces we will create to date. In this work we are looking at Minstrelsy, the wretched stain in American entertainment history that began in the 19th century, and modern day devaluing of Black life as seen in the incidents of police brutality, racially-charged violence and crimes against Black Americans. How do we tackle a piece of such poignancy and timeliness? How do we create with sensitivity and honesty? As a company, one of our missions is to share, explore and react to events seeped in sociopolitical injustice. Past works include Movimento do Povo (Movement of the People), a work that depicts the effects Portuguese conquistadors, Catholicism, slavery, the 20yr Military Regime and racism have had, and still have, on Brazil, Aconteceu/ It Happened, based on the Candelária Massacre of 1993 in Rio de Janeiro, Brazil, where eight street children were massacred by police, and Understand Your Ground, a dance trilogy inspired by the Trayvon Martin trials that provokes the senses and invokes thought about our current society’s stance on racial stereotypes and prejudices. With these works we had to find who we were in the story, how we can be more than dancers dancing and be people telling their story. To prepare for Song & Dance You, and approach the art-making of such a challenging topic, we as a company have been researching and journaling. One question that we have been grappling with is the idea of empathy. How do we, a diverse cast with varying experiences with racism and objectification [in America], truthfully explore this idea of the dehumanized Black life? How can we collectively articulate the need for all humans to be regarded as such? How do we become vulnerable and open ourselves up in order to recognize the emotion in other people and communicate the emotion of other people?